The page Testing Auditory Processing Skill covers the significance of one sort of auditory processing, that being to manipulate phonemes within a word. If clients of OnTrack Reading missed any items on that test, they were always given some exercises to do orally which would help them improve their phoneme manipulation ability. If your child finds these oral exercises too difficult, spend some time working on this phonemic awareness skill by using letter tiles to help him make the required linkage between sounds and symbols. Those exercises are described in Auditory Processing with Tiles. Before you begin the exercises described here you should download the PDF file below. It is a list of words divided into seven categories which I’ll describe next. Incidentally, a similar list can be found on the last page of the OnTrack Reading Advanced Code Phonics Workbook which, together with its comprehensive instruction manual, comprises a complete advanced code phonics program covering phonics skills, code knowledge, and a well-tested multisyllable decoding method you will find nowhere else. First, notice that each list is organized so that almost all of the consonant sounds are manipulated, with two or three examples of each. For example, the first row of words all start with the /b/ sound, the second all start with the /c/ sound, etc. If you notice that your child has trouble deleting one particular sound, make sure and use the other examples on that row at some point. You will notice that each response sounds like a real word. This provides a cue to your child that he’s on the right track. Also, since the spellings of the real words differ from what is being said orally in many cases (eg versus egg,) your child will not easily be able to do this exercise visually, that is, by picturing the word in his mind and reading the result. In many cases, he will have to do it using only the auditory route, which is what you are trying to achieve. This first category is the easiest for most children, so start with it, going over several words to see if any particular starting sound is harder to drop than the others. Then move on to Category 2. Category 2: (Delete Ending Sound): Following the same procedure as described for Category 1, ask your child to say the word first and then ask him to say it without the target sound, which in each case here is the last sound in the word. The first row of words all end in the /b/ sound, the second in the /c/ sound, and so on, so again be watching to see whether your child experiences any difficulty deleting a particular sound and work more on those. 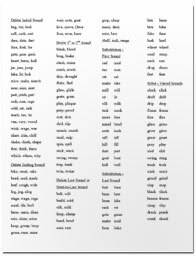 After your child can do the words in this list with reasonable efficiency, start mixing up Category 1 and Category 2 words, first having your child delete a first sound, and then a last sound from the other list. After he can easily move back and forth handling first and last sounds move on to category 3 words. Category 3: (Delete First or Second Sound): Think of this category as having two subcatgories, 3a and 3b. Each of the rows cover a different initial blend permitted in English words and in each case it is possible to leave off either the first or second sound and get a recognizable word, although the spellings might differ. Thus plaque without the /p/ is lack, and again, this is advantageous as it makes it more likely that your child is using the auditory route to get the correct answer. If he gets the examples that are easy visually (black/lack) but misses the ones that have spelling changes (plaque/lack) that is a clear sign that he’s relying on the visual route and needs this type of exercise even though he appears to usually be successful. Deleting the first sound is easier, although if your child has been trained to treat blends as one entity he will have some trouble leaving off just the first sound. Work down the list having him delete only the first sound. When he can do that fairly easily, go back through the list and have him delete the second sound ("Say black without the /l/") which is more difficult usually. As with the first two categories, once he can delete the second sound, mix up the task by alternating your requests between first and second sounds randomly to build your child’s awareness of the location of the various sounds. Then, when he can alternate in this way, move on to Category 4. Category 4: (Delete Last or Next-to-Last Sound): Again, this is really two subcategories 4a and 4b. 4a involves deleting the last sound, as this is the easier task usually. Because there are only a limited number of ending consonant blends in English words, this list is shorter than the others. Repeat the process described for Category 3, working on 4a, then 4b, then mixing it up. Then start mixing up requests from all four categories and subcategories. When your child can handle anything you ask of him in this regard, move on to Category 5. Category 5: (Substitution-First Sound): Now we are finally getting to the point of all this, which is to train your child to easily switch from one sound to another in a spoken word. Why is this important? Because for your child to easily test first one option for a letter or digraph in an unfamiliar word and then another option he must develop a facility for quickly making the switch orally without having to reblend the word sound by sound. With this list you tell your child to “Say sad, but change the /s/ to /m/.” The first word is the starting word and you use the second word to figure out what the new sound is supposed to be. Don’t forget that /s/ and /m/ refer to sounds, not letter names. After your child can easily switch initial sounds, move to the next category. Category 6: (Substitution-Last Sound): Do the same process as with the previous category, then start randomly mixing your requests between Category 5 and Category 6 words. After your child can easily do that, move to the Category 7 list. Category 7: (Substitution-Varied Sounds): Here you will use the first word as a starting point and then use the second word to figure out what to tell your child to do. For example the first row is clock-click. This means that you should ask your child to say clock but change /o/ to /i/. Once your child can easily do all seven categories, his skill at manipulating phonemes should be reasonably well developed. This skill is trainable, and OnTrack Reading clients almost always became capable of doing all seven categories. As a shortcut, if you’re just mildly concerned about your child’s skill at phoneme manipulation, just make sure that he can do the Category 3a/3b and 4a/4b words and then jump to Category 7 and pick a word with a vowel sound like the sled-slid example. Pick one that you can think of a progression of vowels that result in words (sled-slid-slide-slowed) and have your child move through the whole progression. If he can do that, he’s basically showing you that he’s capable of switching vowel sounds easily in a word that he’s trying to decode, and that, after all, is the purpose of all this. Author's Note: If you found the information here useful, please share this OnTrack Reading page with other parents and teachers who might also find it helpful. Over a few sessions, most children can be trained to efficiently manipulate sounds within words, an essential skill if one is to become proficient at decoding unfamiliar English words.